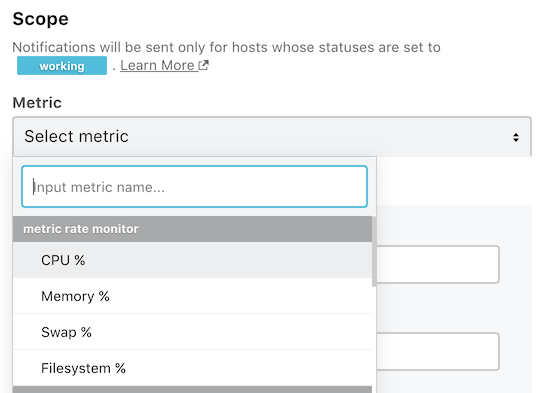 When creating a host metric monitor, you can select the following four items to be monitored. These monitors fall under the category metric rate monitor and can be set to be monitored based on information of "metrics sent from mackerel-agent” (system metrics). For metrics in this category, thresholds are specified in "percentage" (with 100% as a whole). Detailed specifications for the above four items are as follows. Regardless of the number of cores, the 100% - idle% percentage is specified as the threshold when the whole is 100%. The used percentage is specified as a threshold for total. The swap used percentage is specified as a threshold for swap total. The used percentage is specified as a threshold for size. When metrics of multiple file systems are posted, the file system with the highest utilization rate and the thresholds are used for comparison.